I'm sure you, like me, have seen a lot of stories (in books, movies, shows, etc.) where a rational explanation is found to a scary or suspicious situation. It comes to my mind the old episodes of Scooby Doo, always ending with the monster or ghost being unmasked, turning to be only an unscrupulous person with a selfish interest in scaring the rest in order to get some particular benefit. It always worked with Scooby and Shaggy, but smart Velma, with Daphne and Fred will find an absolutely "from-this-world" answer. 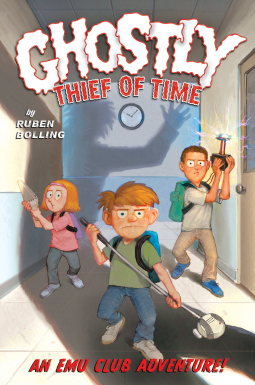 In GHOSTLY THIEF OF TIME the characters will do all the contrary! Stuart, Brian and Violet (with the help of Ferdinand, an "alien robot" dog) will find a supernatural explanation to an absolutely normal, ordinary, daily situation. Something is obviously happening with the time in Stuart's sixth grade room. It's evident time goes slower the near of the end of the day it is, and the closer to the back of the room you sit. Why does the last half an hour of the school day seems to last two hours? (Who hasn't wondered about this at least a thousand times?) The EMU Club has a new mystery to solve. Is the school janitor really what he claims to be? Could be the janitor's closet a time portal? You'll need to read this engaging story to find out! This book was a great shared read with my son. It's very funny. We laughed or grinned at almost every page. It's visually attractive, written in an "EMU Club Report" format, with colorful pictures. The characters are likable, and they have a beautiful relationship between them. The time travel elements are easy to follow by the kids, not confusing at all.